College students are notorious for working up voracious appetites. But at Georgia College, students aren’t hungry for long. When your stomach starts grumbling, you’re never more than a few minutes away from a variety of delicious and eclectic food choices. For short, call it The Max. It’s a great place to get your fill of a wide variety of delicious food. Have all you care to eat from the pizza/pasta menu, international foods, deli and baked goods, classic home-style meals, grilled burgers and hotdogs, soup and salad bar, dessert bar and more. The 441 Diner is a techno twist to the traditional Route 66 diner concept, incorporating nostalgic elements of Americana with more contemporary elements. Whether you are in the mood for the basic scrambled eggs and bacon or a specialty item like mushroom, ham and Swiss frittata, the 441 Diner is ready to take the order! The 441 Diner serves up those traditional favorites like great tasting burgers, fries, hot dogs and classic grilled cheese; while rotating sandwiches such as Philly cheese steaks and New York-style Reuben’s. So whether you are craving breakfast or something special the 441 Diner is your one stop for comfort food. Pizza by the slice, crisp field greens, toasted garlic bread...these and many more tempting choices await students at the Milla D’Villa. Along with well-known favorites, customers will find varying daily baked pasta specials including lasagna and eggplant parmesan. Milla D’Villa also serves specialty salads. Magellan's is a centerpiece action station where guests can enjoy a fun and interactive dining experience. 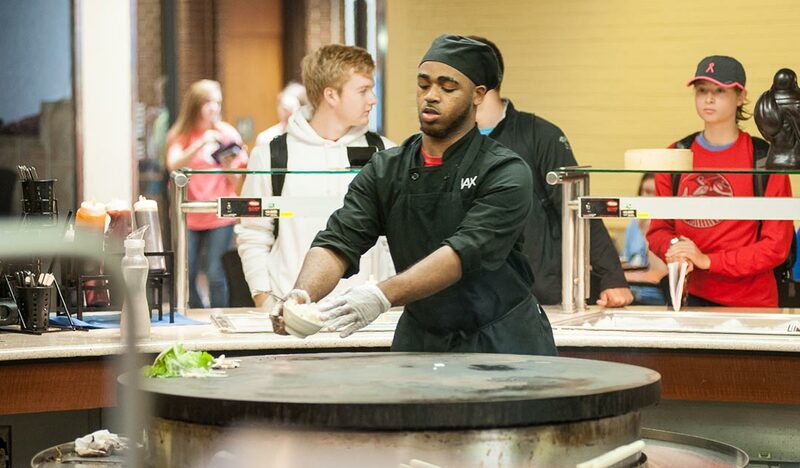 Fresh, healthy food options flourish and this station can accommodate a wide range of cuisines from Asian to Southwest and everything in between. Guests can pick out ingredients, hand them to the chef, grab a seat on a bar stool and watch as the chef prepares their meal! We are excited to offer authentic Mexican cuisine that includes tacos, burritos, enchiladas, chips and fresh made salsa. Freshly-baked breads and a variety of deli meats and cheeses topped with your favorite sandwich condiments will make Sinclair’s Sandwiches a customer favorite. In addition to classic deli sandwiches, paninis and wraps, homemade side salads and hearty soups are available to accompany each delicious meal. Also students will be able to fix their sweet tooth with a wide spread of desserts made daily! Cookies, cupcakes and pies are just a few of the sweet desserts you can expect to find. The Greene St. Salad Bar offers a large selection of fresh salad toppings and homemade dressings to top it all off. Beloved by bovines, Chick-fil-A operates one of the nation's largest fast-food chains that specializes in chicken dishes. Boasting about 1,400 restaurants in almost 40 states, the chain offers chicken entrees, sandwiches, and salads, along with its popular waffle fries and fresh-squeezed lemonade. Who can ask for more? Located at The Bobcat Food court. Einstein Bros. Bagels offers quality fresh bagels, many gourmet "shmear" (cream cheese) flavors, fresh sandwiches, and piping hot bagel dogs. You can also purchase a variety of salads, hearty soups, sodas and juices, fresh brewed coffee, along with breakfast sandwiches and fresh baked muffins. If you are looking for a tasty dessert then try one of Einstein's cookies, brownies, or rice krispy treats. Grab-n-Go Sandwiches, perfect for when you're craving a delicious sandwich but don't have time to wait in line! 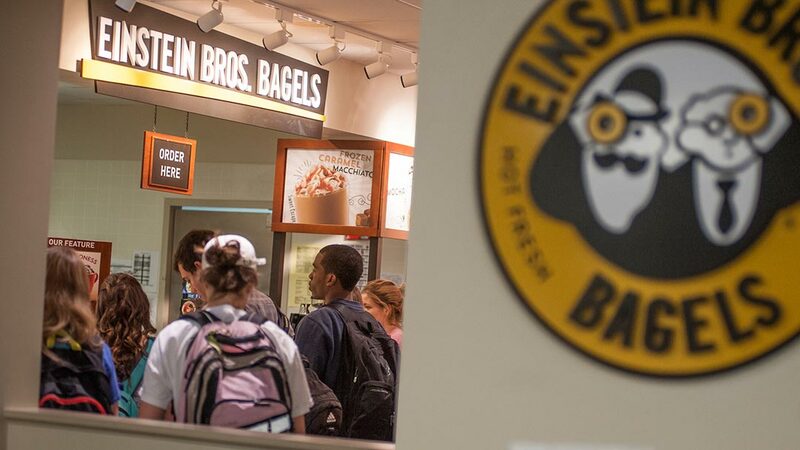 It's the same delicious sandwiches from Einstein's Bros. Bagels but way more convenient! Choose between Tasty Turkey, Deli Turkey, Veg Out, Deli Ham and Deli Tuna. Try one today! Located at Maxwell Student Union. Subway, located in The Bobcat Food court, serves delicious sandwiches, salads, and more for lunch and dinner! Featuring Starbucks coffee, muffins, fruit smoothies, grab & go sandwiches and salads, bottled beverages and more. This coffee house is conveniently located in the library to provide you with that cup of Joe when you really need it during those mid-terms and finals. Don't forget us during your regular day though. Located in the library. Grab your lunch favorites to go! Located in the courtyard area of the Arts and Sciences building, the Lunch Box offers lunch items including sandwiches, salads, chips, and more! Items are available for purchase with cash or you can use your meal plan equivalency.